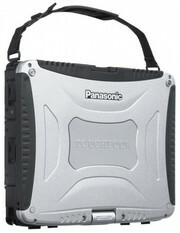 Panasonic has persisted for many years with its Toughbook line. 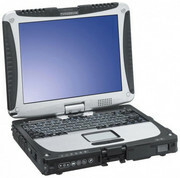 If ever there were a case of ‘if it ain’t broke, don’t fix it’, the Toughbook would be it. First, this is because the Toughbook was done well in the first place; but second, because it’s extraordinarily hard to break. And that is, after all, the point. We can’t, in good conscience, offer any prizes in terms of looks, but this is a practical machine first and foremost, built to withstand inclement conditions, and it’s armoured to the hilt. This doesn’t mean that you’ll be able to dunk it in water and get away with it, but its MIL-STD-810 certification means it’s built to withstand splashes and spills, vehicle vibration, the occasional drop, and harsh extremes of temperature. 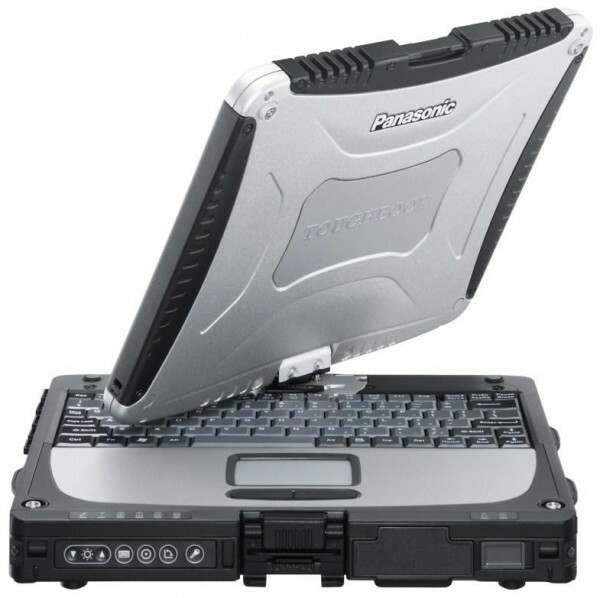 Panasonic's Toughbook laptops are a common sight at PC Pro, but it's usually in the shape of semi-rugged portables. The CF-19 is an altogether different animal. 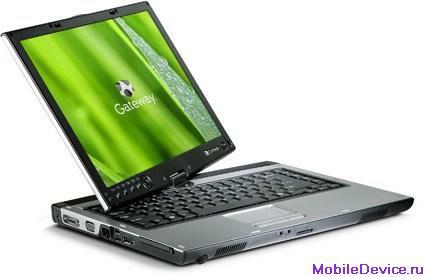 It's a beast of a laptop, aimed at use in extreme environments, from oil rigs to fishing trawlers. It's certainly one of the most solid laptops we've ever picked up. And what it lacks in portability - though compact, at 2.25kg this is not the lightest laptop in the world - it makes up for in sheer resilience. A rough, tough laptop with serious attitude, but its keyboard proves an Achilles heel. This 10-inch rugged tablet offers field-workers epic battery life and a bright display, although the keyboard might be too cramped for some users. 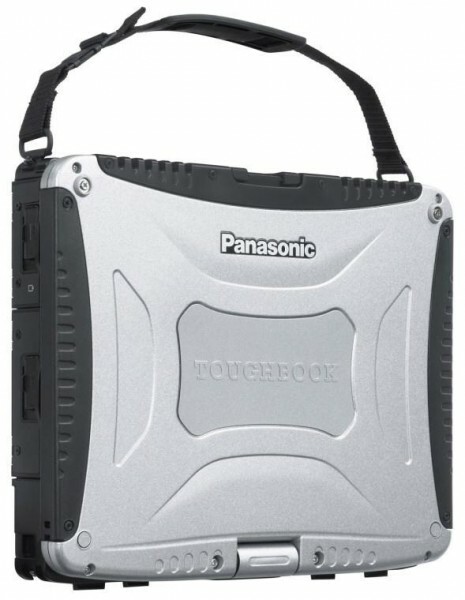 As a fully rugged 10-inch notebook, the Panasonic Toughbook 19 occupies a class all its own. If you want a military-grade notebook that will last the whole day and won’t break your back—and you have the room in your budget—the Toughbook 19 is an excellent choice. 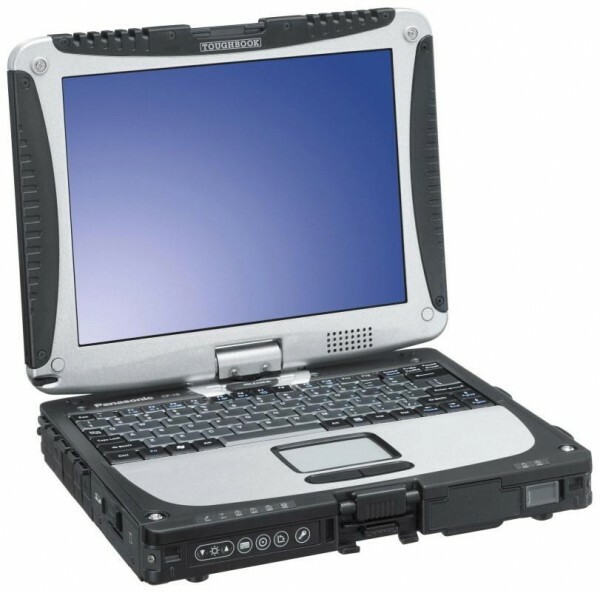 70% Panasonic Toughbook CF-19 - This durable notebook begs for abuse. The Toughbook line continues to impress with the CF-19, a machine that begs to be used and abused in a rough-and-tumble environment. Its daylight-readable touchscreen is the standout feature, along with its bevy of tucked-away slots and ports. At almost $4,300, this isn't your run-of-the-mill, spill-a-little-coffee-on-it semi-rugged notebook. It's a fully ruggedized computer that's designed to perform in the field. If you want a reasonably small and light notebook that will stand up to almost anything you’re likely to throw at it, the ToughBook CF-19 is just what you’re looking for. The keyboard doesn’t lend itself to writing long reports or essays, but this machine is more likely to be used with bespoke applications for data entry out in the field. With the option of an HSDPA module, engineers and field workers will now be able to communicate and send data back to the office even faster. If however you’re looking for something that is tough as nails and can be used to write long documents just like any other notebook, you’re probably better off waiting for the forthcoming ToughBook CF-30, which I’ll be reviewing soon. Ultimately, the CF-19 makes a few ergonomic sacrifices for the sake of weight and size, while throwing the tablet style operation into the mix, and if that’s what you need, look no further. 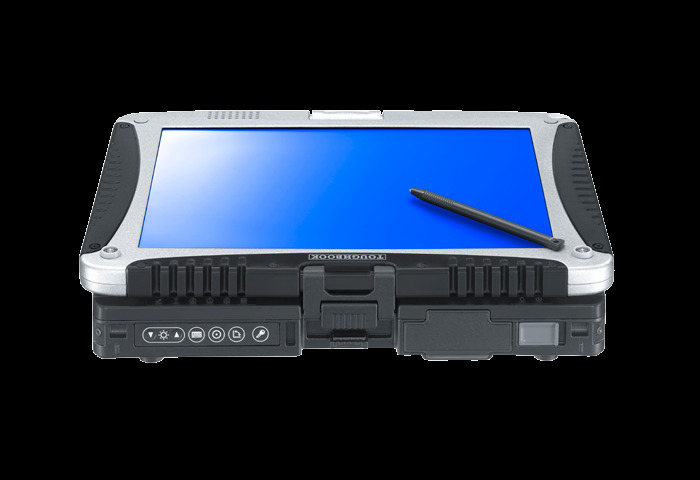 The Panasonic Toughbook CF-19 certainly doesn’t disappoint in this regard. It’s tough as nails and built like a brick. It’s absolutely stuffed with connectivity and features while offering superb battery life. And it has very little competition as it’s the one of a very few big-brand, fully rugged convertible tablet/laptops that’s widely available. However, its low screen quality and resolution are disappointing in a device this expensive. Go-anywhere mobile connectivity for this Toughbook 19 is assured via optional 4G/LTE (Verizon, or AT&T) or Gobi 3G modules, and integrated GPS can be wired in so your seargant knows where you are in the field while he sups his brandy-laced tea from the comfort of his favorite armchair. And just to remind you it isn’t a toy, there’s a sobering $3549 price tag to keep your frost-bitten feet on the ground. 36-month guarantee is included in the price. Intel Graphics Media Accelerator (GMA) 950: Integrierter (onboard) Grafikchip auf Mobile Intel 945GM/C/Z/ME/ML Chipsätzen und Nachfolger des GMA 900. Kein Hardware T&L (für manche Spiele benötigt). Für Spiele kaum geeignet.Diese Karten können nur sehr alte und sehr anspruchslose 3D Spiele flüssig darstellen. Anwendungen wie Office, Internet surfen, Bildbearbeitung oder (SD) Videoschnitt sind jedoch ohne große Einschränkungen möglich. 2520M: Auf Sandy Brige Architektur basierender Doppelkernprozessor mit integrierter Grafikkarte und integriertem DDR3 Speicherkontroller.3320M: Auf der Ivy Brige Architektur basierender High-End Doppelkernprozessor (2,6-3,3GHz) mit integrierter Grafikkarte und integriertem DDR3 Speicherkontroller. 73.89%: Diese Bewertung ist schlecht. Die meisten Notebooks werden besser beurteilt. Als Kaufempfehlung darf man das nicht sehen. Auch wenn Verbalbewertungen in diesem Bereich gar nicht so schlecht klingen ("genügend" oder "befriedigend"), meist sind es Euphemismen, die eine Klassifikation als unterdurchschnittliches Notebook verschleiern.» Lesen Sie auch unsere Notebook-Kaufberatung.